You need to make a habit of habit. You know why making the transition to working for yourself is so challenging? Because you are learning a whole new set of habits for doing your work and all at once! Changing one habit, let alone several at the same time, is super challenging. What’s even harder is sticking to a new habit when you don’t see immediate results. When you start seeing the results of your habits you are more motivated to continue the habit, but how do you stay motivated long enough to start seeing results? I learned this mantra from Gretchen Rubin’s book Better Than Before. It’s all about adjusting, developing and strengthening your habits. Her most important piece of advice was to make a habit of habit. I’ll explain using an example. Say you want to start running every morning to help you lose 10 pounds. You might be super excited and committed the first few days or even during the first week, but then distractions start tempting you from maintaining your new habit. You skip one day because it’s raining. You skip another day because you have to go into work early one morning for a meeting. During the first few weeks you only lose 3 pounds. You start getting discouraged. The results you expected aren’t happening fast enough. The excuses to skip your morning run get less urgent until you stop running altogether just because you don’t feel like doing it. Instead of making a habit of running every morning. Make a habit of the habit of running every morning. For example, if you normally allow 30 minutes for your run, but only have 15 minutes, then run for just 15 minutes. If you only have 1 minute, than jog in place for that 1 minute. The point here is to not give up on the habit. Make it a part of your life every day, so it becomes part of your normal routine. Instead of seeking excuses not to run, you seek alternative options for sticking to your habit. 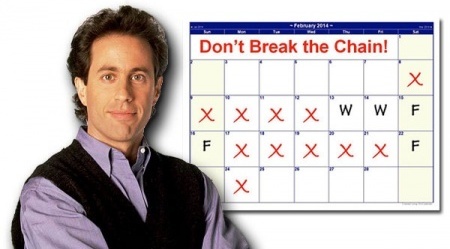 Jerry Seinfeld referred to this method of habit development as “don’t break the chain”. He committed to writing at least one joke a day, no matter how good or bad it was. He made a habit of habit of writing jokes. When you are developing a habit, it takes time to see the results. Some days you feel amazing about your habit and other times you have doubts. Making a habit of habit helps you ride through those moments of doubt, so you can stick to your habit long enough to start seeing results. Crazy as it sounds, while it might not feel like you are doing much by doing the minimum version of your habit, it actually strengths your overall habit by getting you to keep doing it! Try one of the following 3 exercises to make a habit of habit. Exercise #1 Commit to the trigger action. What is the very first action you need to take to start your new habit? What’s the trigger? Dancer and choreographer Twyla Tharp starts her gym habit early each morning by hailing a cab from her apartment in New York City. She knows that once she gets a cab the momentum of her habit has begun. It’s the trigger. She’s going to get dropped off at her gym, then walk in the door and start her exercise routine. We often think of our habit as the new action we want to start in our lives. 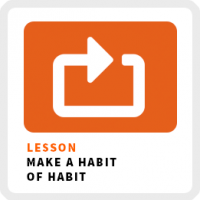 We overlook the set of actions required to trigger that habit, which are actually part of the habit process. If you want to start running, putting on your running shoes might be your trigger action. Have a plan in place for when you don’t have your desired amount of time to practice your habit. I recommend identifying the 5-minute version of your habit. Make a plan for how you can practice your habit if you only have 5 minutes. No matter how busy life gets, you most likely can always find 5 minutes to maintain your habit. Exercise #3 Piggyback on existing habit. One of the most effective methods for starting and maintaining a new habit is by integrating it with one of your existing habits. You are already doing something over and over, so tap into that momentum to spark your new habit. For example, a couple of years ago I wanted to get into the habit of putting face lotion with sunscreen on my face every morning to protect my skin, but I kept forgetting to do it. Then I realized, I could use my habit of brushing my teeth every morning to spark my new habit. As soon as I’m done with brushing my teeth, I immediately put on my face lotion. I view it as one habit now. Brushing my teeth becomes the cue from putting on my face lotion. One final recommendation, when you are starting a new business, pick one habit to build first. Make a habit of just one of your habits. You will be more successfully committing to your new habits by building them one at a time. And if you’ve listened to my podcast long enough, you know the most important habit for building your business is your habit of reaching out to people who can help you build your business!